This blistering anti-war story by a Japanese WWII vet is a rarity for the Western reader: an example of Japanese military dissent circa World War II. Shigeru Mizuki is a landmark figure in the development of manga (Japanese comics), but only now is his work being translated into English. 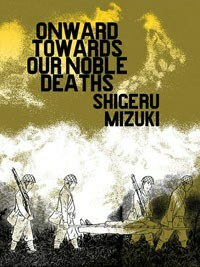 His epic graphic novel, Onward Towards Our Noble Deaths, is a gritty tale of World War II and far removed from the fantasy work which as made him a superstar in Japan. Nevertheless, the book is a powerful one, and well deserves the attention of any fan of the genre. The first thing that strikes the reader about Onward Towards Our Noble Deaths is its heft. At 362 densely packed pages, the story feels as weighty as its subject matter. The opening pages present a list of characters, as you might get in a novel by Dostoevsky or Flaubert; Mizuki's story contains no fewer than 30 named characters, each favored with a distinctive visual characteristic. Many of these characters are differentiated in only the most general of terms—this one thinks only of food, this one of women, this one of duty—but the scale of the story is nevertheless impressive. The author is aiming here for a depth and breadth of story that few other graphic artists attempt. The fact that the book dates from the '70s—a time when American comics were concerned with Spider-Man and The Justice League, and even "underground" comix emphasized small-scale stories—makes Mizuki's ambition all the more remarkable. The story itself is tragic. A company of soldiers occupies the island of New Britain, a scrap of an island in the New Guinea archipelago, in 1943. They are ordered to hold the island, whatever the cost. When the enemy arrives in the form of Australians and Americans, that cost becomes ludicrously high. A lone group of soldiers, clinging to the defense of the island, is ordered to make a suicidal charge against the far more numerous and better-equipped enemy. The attack, naturally, is a failure. By some quirk it's even a failure as a suicide charge, as some of the men manage to fall back and regroup, where they await orders from the rear. However, their heroic sacrifice has already been reported to the officers in command, leaving a dilemma that offers only one terrible, pointless solution. As an American whose parents lived through World War II, I grew up hearing stories of Japanese relentlessness and implacability. Documentaries like the BBC's The World at War reinforced the message: Japanese soldiers placed honor above all, seeing death not only as their duty but their highest achievement; they would fight and die and kill to the last man, even in a lost cause. Most of all, I grew up with the understanding that Japanese military discipline was beyond compromise. Mizuki challenges these assumptions and many others. Not only did he serve in the Japanese army during the war—losing an arm in the process—but Onward Towards Our Noble Deaths is based upon his personal experience. The time and place of events is a matter of historical record, as is the order for the suicide charge. Mizuki's injury was the only thing that kept him out of the final battle. This, then, is a rarity for the Western reader: an example of Japanese military dissent circa World War II. Although the book was first published in 1973, it provides a fascinating glimpse into the Imperial Army of the 1940s. The glimpse is not an inspiring one. Morale is low, food is scarce, women are chattel, superior officers are brutish and cruel. Physical humiliation of young soldiers is commonplace. Soldiers die in a variety of absurd, pointless, stupid and unheroic ways. At one point, when a sergeant is apparently eaten by a crocodile, the enlisted men rejoice. So much for discipline. Just as striking as the story is the artwork. Mizuki utilizes a powerful two-pronged approach. Meticulous, almost photo-realistic images are used for landscapes and backgrounds as well as for military encounters: planes in the sky, ships shelling the beaches and so on. Island mountain ranges and palm-shrouded beaches are presented with rich texture as the eye plays over them restlessly. These landscapes are populated with cartoony human figures delineated in simple line drawings and differentiated with a singular characteristic: this one's buck teeth, that one's razor stubble, this one's squinting eyes, that one's heavy chin. There is some repetition to these visual cues, so not all characters are instantly identifiable. Given that the war setting emphasizes conformity among the men, and thematically suggests that it is this uniformity that leads to the tragedy that awaits them, this visual sameness is not a criticism of the book. Indeed, there is little here to criticize. Perhaps some of the transitions are a bit abrupt, maybe some of the characterization could be sharper. Overall, though, this is an immensely powerful story, a cry of rage against the futility of war and the stupidity of the military mindset. Anyone interested in the topic—and perhaps especially anyone who is not—is encouraged to take a look.